The Blackburn Aeroplane Company was founded by Robert Blackburn, who had designed and built his first aircraft in 1909. 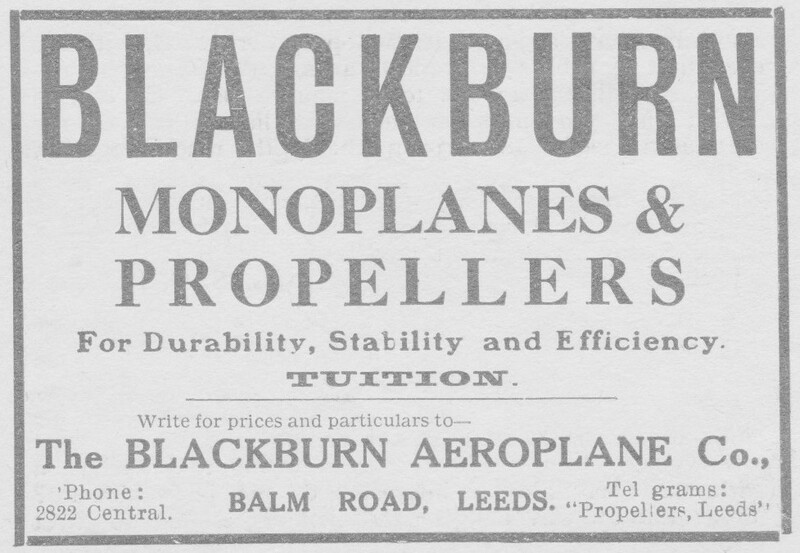 The Blackburn Aeroplane & Motor Company was created in 1914. A new factory was built at Brough, East Riding of Yorkshire in 1916. Throughout the company's history the emphasis was on the design and production of naval aircraft; its first for the Royal Navy was the twin-engined GP seaplane of 1916. A similar landplane, the Kangaroo, was supplied to the RAF in 1918. Aircraft to serve with the Navy include the Baffin, Blackburn, Buccaneer, Dart, Firebrand, Ripon, Roc, Shark and Skua. In 1930 acquired Cirrus Hermes Engineering Co. By acquiring the Cirrus-Hermes company in 1937, Blackburn started producing aircraft engines - the Blackburn Cirrus range. Blackburn Aircraft Company founded 1936. The company's name was changed to Blackburn Aircraft Limited in 1939. During 1948, discussions between General Aircraft Ltd and the Humberside firm of Blackburn led to a merger of the two companies under the joint name of Blackburn & General Aircraft Ltd. The new company was formed on 1 January 1949 and it was proposed that all work in progress at the various factories be com­pleted as originally planned. Company name reverted to Blackburn Aircraft Ltd. in 1959, when Blackburn & General became the holding company. Its aircraft production operation was absorbed into Hawker Siddeley in 1960, and its engine operations into Bristol Siddeley, as part of the rationalisation of British aircraft manufacturers, and the Blackburn name was dropped completely in 1963.